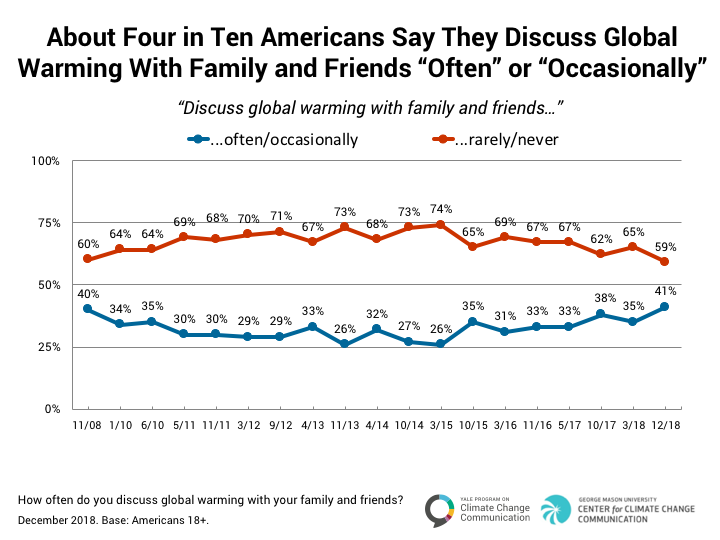 About four in ten (41%) Americans say they discuss global warming with family and friends at least occasionally. Although the majority of Americans (59%) rarely or never discuss global warming with family and friends, the percentage who do discuss global warming is six points higher than in March 2018, and is at its highest level since our surveys began in 2008. 4.2. 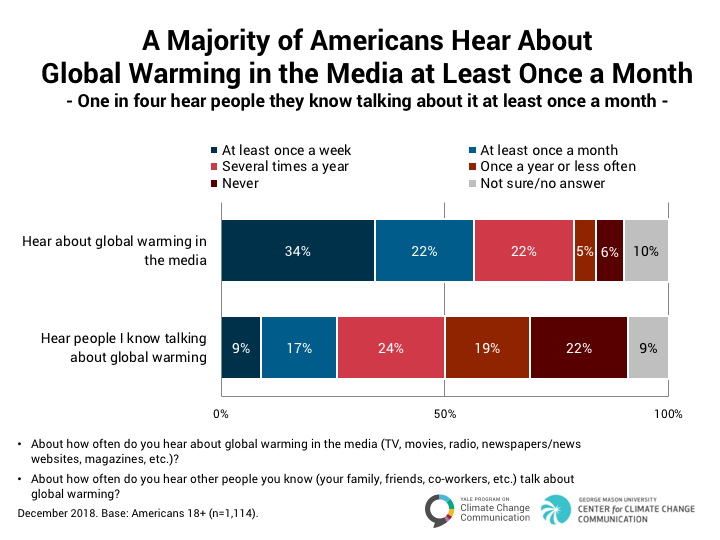 A majority of Americans hear about global warming in the media at least once a month; about one in four hear people they know talking about it at least once a month. A majority of Americans (56%) say they hear about global warming in the media once a month or more frequently, an increase of 13 percentage points since our previous survey in March 2018. About one in four Americans (27%, a 10-point decrease since March) say they hear about it in the media only several times a year or less, and 6% say they never hear about it. Only one in four Americans (26%, +6 points) say they hear people they know talking about global warming once a month or more. In contrast, 43% say they hear people they know talking about it only several times a year or less, and about one in five (22%) say they never hear people they know talk about global warming. 4.3. The issue of global warming is personally important to about seven in ten Americans. 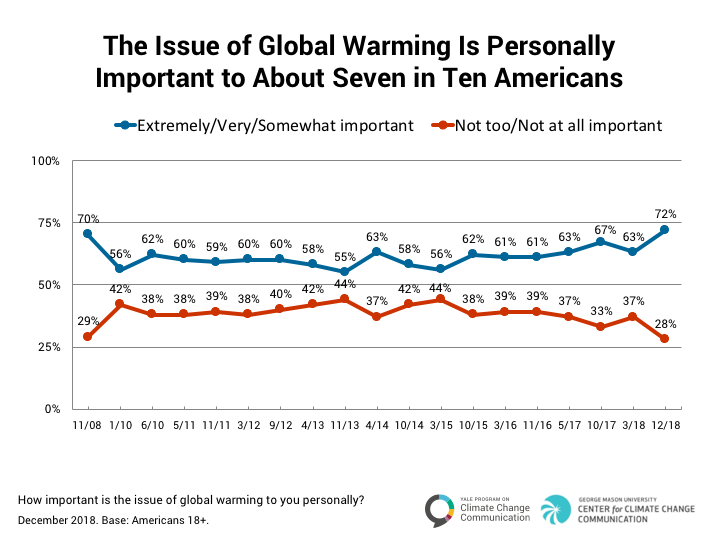 About seven in ten Americans (72%, +9 percentage points since our previous survey in March 2018) say the issue of global warming is either “extremely” (16%, +6 points), “very” (24%, +6 points), or “somewhat” (32%, -3 points) important to them personally, the highest level since our surveys began in 2008. About one in four (28%, -9 points) say global warming is either “not too” (15%) or “not at all” (14%) important personally, the lowest level since our surveys began. 4.4. Fewer than half of Americans perceive social norms for taking action on global warming. Fewer than half of Americans (46%) perceive an injunctive norm, saying it is either “extremely” (6%), “very” (13%), or “moderately” important (27%) to their family and friends that they take action to reduce global warming. 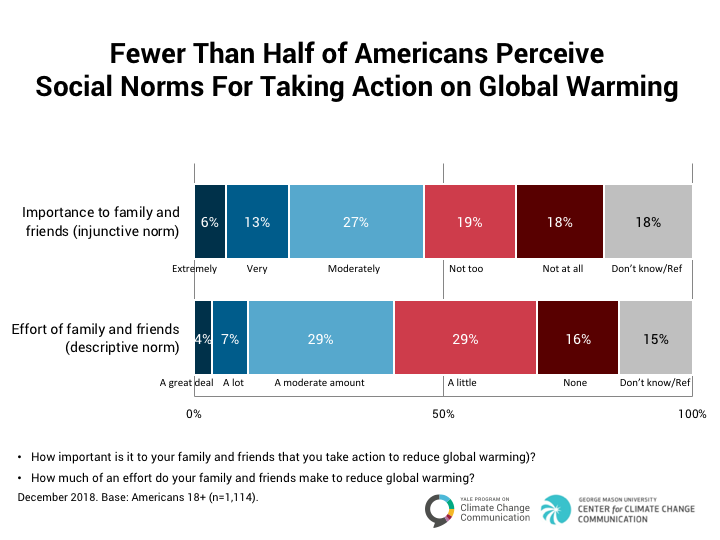 Four in ten Americans (40%) perceive a descriptive norm, saying their family and friends make either “a great deal of effort” (4%), “a lot of effort” (7%), or “a moderate amount of effort” (29%) to reduce global warming. 4.5. 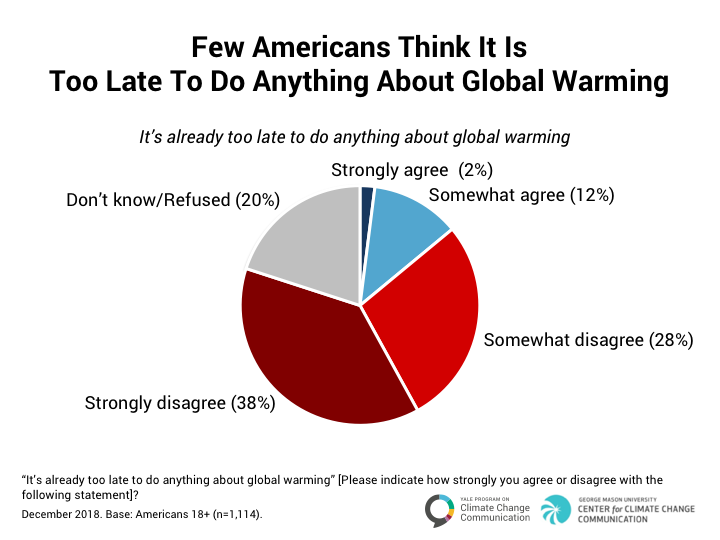 Few Americans think it is too late to do anything about global warming. Only about one in seven Americans (14%) either strongly (2%) or somewhat (12%) agree that it is too late to do anything about global warming. In contrast, two in three Americans (66%) are more optimistic – they either strongly (38%) or somewhat (28%) disagree that it is too late to do anything about global warming.